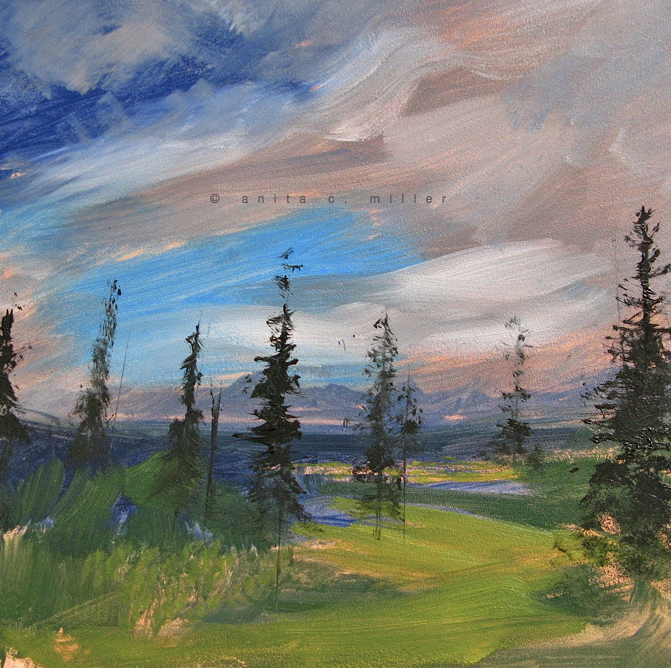 Categorieslandscapes Tagsart, available 6" x 6"
This one I like very much! Thank you, rabirius. I’m glad you liked it. Thank you so much, Violet! You are definitely showing me my landscape, in your wonderful style. I’m so happy you like it. You certainly know those spruces! Thanks, Annerose! Well done! I like this one very much Anita!! Thank you, Susan. I’m glad you enjoyed seeing it! This one has a atmosphere of Spring. It’s the bright green, I think. Lovely. Thank you, Patricia. That bright green is a favorite of mine. Anita, I love the distance and sky you created here and super wilderness with black spruce. I was happy that the distance came across. It’s really fun to try to make a little painting seem like it’s really big. I think it’s my newest fun challenge to myself. Thanks so much, Doron! Thanks, Jennifer! Yes, the landscape in Alaska is profoundly beautiful. I was mostly with a tour group which is the opposite of serene and peaceful! I was often feeling conflicted because I did want to experience it in a more quiet way.